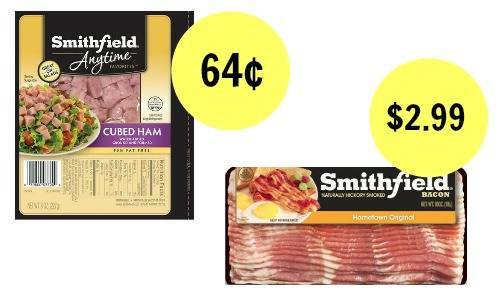 Right now you can print a couple of new Smithfield coupons! You can save on Anytime Favorites products and also on bacon. Use the coupons to get ham for 64¢ at Publix (starting 10/26) and $2.99 bacon at Bi-Lo (ending 10/25)! This deal begins on 10/26. This deal is valid through 10/25.